It's been a week! And it's not even over!!!!! I have posted about my issues about spinning, but the laughter has gone way past my lack of knot knowledge! hehe I went out one day to work with the boys and bent over to pick something up only to have Lefty take hold of my hair and pull! I screamed, he let go and all three were scared to death. I pulled out my phone, turned on the camera, changed it to view me and checked to see if I was bleeding and had a bald spot. No I didn't, but it hurt like "he double hockey stick." Then I didn't give him his food as quickly as he thought I should and he spit on me. Little bits of green grass on my arm and I was not a happy camper. To add to the excitement, Pancho headed out to the back fence where there are left over, dried up berry brambles and he rubbed his side along them and came away with lots of sticks sticking out all over him. His problem, except, we head to shearing on Tuesday and sticks covered with stickers in his fiber then become my problem! Sam tried eating a tree and I felt like it was an alpaca conspiracy!!! When Bill got home and I began to tell him of my afternoon, we had to just sit and laugh. It all sounded so trivial in light of what so many are going through. Oh, my goodness, we can take little things so seriously, when they are just down right funny when you step back and look at the big picture. I have learned a couple of things - one don't bend over in front of an alpaca, feed them quickly and about the sticks and trees, well, alpacas will be alpacas! Then the big laugh came when I found my package from Blick Art Supply Store on the porch. I had ordered some new acrylic paints and some brushes. I told Bill I was so excited to get my brushes. I love an angular shaped brush for painting my flowers on the stepping stones. I've looked at Hobby Lobby and other places and just couldn't find my angular brushes. I was so excited when I found these brushes available at Blick. I immediately ordered two different sizes and some paints. 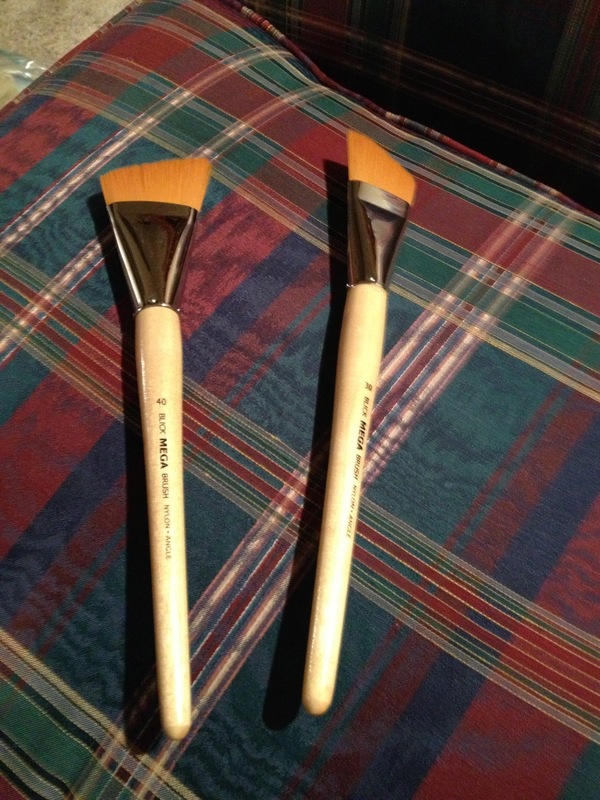 I go through a lot of brushes because I paint on concrete, so finding these was a real treat. So what's funny? Well, imagine my surprise when I unwrapped this roll of cardboard to find these! 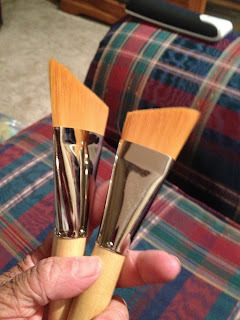 Do you see the size of these brushes! Compare these to the size of my hand!!!! The handle is the size of my thumb! I just sat and stared! 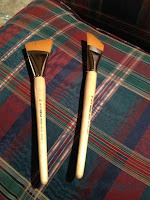 I didn't even know they made brushes this big and why had they shipped them to me? Well, I had ordered Mega brushes. I guess I thought Mega was the brand - lol - but it was the size! It took a minute or two to be able to speak. I brought them downstairs and showed them to Bill and it was like what the heck to you do with these? We both just stared at them and started laughing! I could send them back, but shipping would be insane, so after regaining the ability to think I said, "Well, they'll be good for the big wood pieces I cut out. I still need to add to the Easter Eggs for next year." So they won't be wasted and I've learned to read the full description before I order a brush! It's now Thursday and I can hardly wait to see what else can happen in the next 24 hours! If laughter is the best medicine, I should end this week very healthy! May your weeks be filled with laughter and love! I have been laughing since Friday when I started my drop spindle class! First there was the "what on earth is a slip knot!" Then, as I told you yesterday, there was the "I don't knit." And the laughs continued to roll, much at my expense, but to me that makes it even funnier. I actually like laughing at myself, sometimes alone and sometimes joining in with others! The next big laugh came with the half hitch knot. I said yesterday this would be another post! My new friend, Jeri Brock, showed me how to start my Turkish spindle with a slip knot and then as you spin you use a half hitch following each wrapping of the yarn. She gave me a review lesson on the slip knot (no I still don't get it) and a pretty extensive lesson on the half hitch. I thought I had it down and I actually was able to do it in the car on the way back to the show on Saturday. We had two hours in the car and since Bill was driving I was spinning away. Spin, wrap, think about how to make half hitch, try to make half hitch, finally make half hitch, spin, wrap, repeat the half hitch attempts and finally get some yarn on the spindle. When I got to the show I just couldn't wait to show Jeri my hard work and ask for a review of the half hitch knot. We went over all of the knots again and I headed out to investigate the show and visit with our friends. To say Bill was underwhelmed at all of the fiber is an understatement, but he was more than a trooper asking questions and looking at all of the different fibers, wheels etc. One of his first questions was why I wasn't using a wheel rather than this drop spindle. He thought it looked much easier (don't think it is) but it's also way more expensive! Those of you who know me and just following this blog, you know that I change directions rapidly! Even the name Bev Ann's Mixed Bag sums it up - I don't stay focused long. I am always looking for the new thing and so it seemed prudent to start with the less expensive form of spinning. 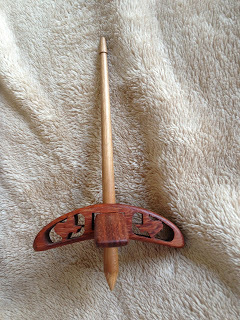 I didn't have a good picture of my spindle yesterday, so here it is today. I love my Turkish spindle. Back to the laughter! We walked and looked and decided to head back to Houston. We were about four or five miles from the convention center and Bill stopped for gas. I pulled out my spindle and roving and prepared for the trip home. I could NOT make a half hitch! I tried, it slipped off! I tried again and again and again. The process had escaped my brain! My sweet husband said, "Do you want to go back?" Can you believe it - he really said that and I said, "YES!" Thanking him all of the way there. Well, back at the show, I walked in and went straight to Jeri's booth and she looked up surprised to see me again. Well, maybe not surprised but rather amazed and I'm sure wondering, "What now?" I confessed I couldn't do that knot! And we began to laugh! She is so great that she had me turn on the video camera in my iPhone and proceeded to demonstrate the half hitch and all of the following steps, so that I would have it when I was away from her. I told her how we had been about five miles away and came back and we laughed more! I'm sure she thinks I'm a complete nut case, but that's OK - we shared big laughs and that is always good and I think she's the best teacher ever! May your day be filled with friends (old and new) and lots of laughter! Oh, my goodness, tell me it's not true that my last post was February 16th! Well, that's on this blog - you know I couldn't be quiet for that long. If you want to catch up on my life, check out Jack and the Alpacas. Anyway, I'm here because I've actually taken a weekend to think of creating and not just caring for animals! To say the boys have been time consuming is an understatement. So for the last two months I have made a couple of cards and a simple little scrapbook for a friend to celebrate her new grand baby, so this weekend is a welcome break. As you know I love to needle felt and we will soon have our own fiber from the boys, so my attention is turning to fiber off the hoof! This weekend I went to the Yellow Rose Fiber Producers Fiesta in Seguin, TX. The Bluebonnet Hills Alpaca Ranch where I bought my boys had a booth with their gorgeous fiber for sale and my favorite wool store W. C. Mercantile was right beside them. I bought my first hand carders and got a quick lesson from Katie, a remarkable 21 year old "fiber genius". She's been knitting since 8 and now spins, dyes and teaches us how to begin the process. All this and college too! She is a wonder! Of course, I was especially drawn to her as that's my "perfect" granddaughter's name and the same kind of joy! When I entered the doors I was blown away by the array of fiber! It was like walking into a rainbow and the friendliest people I've ever met at a show of any sort. Everyone wanted to help me learn, no question went unanswered and I learned so much. 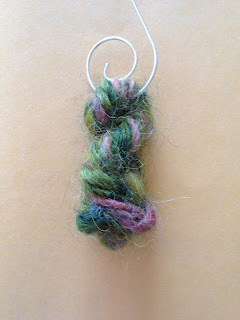 After walking around and my carding lesson, I went to my drop spindle spinning class! It was a small class of about six of us, all of which knitted, except me! The first thing we were told to do once we had seen the beautiful fiber she brought for us to use and were introduced to the spindle, was to make a slip knot. For many of you that probably sounds like a simple instruction, but I just sat there with a blank look on my face as five other ladies quickly made their knot and slipped it over the top of the spindle. I just had to take a deep breath and say, "I'm sorry, but what is a slip knot?" Heads spun and the woman next to me showed me how. Not that I remembered later, but she helped the class move along. No one ask why I wouldn't know how to do that if I was a knitter and if I wasn't a knitter why was I taking this class. I made no confessions! From that point on we were all beginners and I loved the process of spinning with this old and simple method. I actually made decent single ply yarn. Our teacher showed us another type of spindle called a Turkish spindle (no idea why it's called that) and it was interesting, but then she said, "You start it with a half hitch! Well, in my mind that was out of the question - another knot! No way! Class ended and I headed over to show my progress to my friends and I saw the "Jeri Brock Woodworks" booth. I had just received a 10% discount on spindles so I stopped. What beautiful spindles! All hand made by Jeri of beautiful woods and I knew I had to have one. So I was preparing to ask about them when my spinning instructor appeared. She said, "Hello. I see you found the booth. Aren't these spindles beautiful?" I said, "They are beautiful and now I just need help on choosing one." I turned to Jeri for help. Now this is the fun part! Jeri said, "What type of yarn do you want, as that determines the type of spindle?" I looked at her with that same blank look I had over the slip knot! She looked at me and said, "What do you knit?" I loudly exclaimed, "Oh my, I don't knit!" I wish you could have seen the look on her face! Her eyes were wide open with surprise and wonderment and the heads in every booth around us spun around! My instructor simply said, "She just got alpacas and is starting the process from the opposite direction than most of us!" I loved this comment and we had a big laugh and Jeri proceeded to introduce me to the types of spindles and when she showed me the simple process of making a ball of yarn as you spin with the Turkish spindle I was sold! She showed me the half hitch knot ( this will be a separate post) and I got my first Turkish spindle. Jeri hand carves all of her spindles and they are beautiful. I got one with cutouts of Texas, but it won't be my last and so I will be collecting many of her designs. She encouraged me to spin for at least 10 minutes every day for seven days and I would be shocked at how much improvement there would be; so I've started that plan and this is my first little ball I made on Saturday as Bill and I drove back down to the show. She took it off the spindle and made a tiny little skein for me to save. Everyone says we must keep our first skein, so she put it on a decorative holder for me to put on the tree each year. I have so much more to say about spinning, the fesitval and fiber plans, but reality sets in and I must get some things done today, so I am putting my stories on hold. So much to say, so much to do, so little thyme!